In the sense that it involves a few vertebrates getting together for a dressier event, Andrea Doss’s acrylic painting A Very Fancy Tea Party is like all other tea parties. However, because of a more biodiverse guest list, it is quite unlike all other tea parties. These is no denying that the idea of a giraffe, a panda, and a rabbit all drinking beverages from small cups, consuming beautiful baked goods, and wearing bowties is ridiculously cute, however are some unavoidable logistical challenges. Most obviously, there is the geographical problem. Pandas are from China, giraffes are from Africa, and rabbits are from North America. Even with access to modern technology and infrastructure, international travel is hard. Now, dear reader, if you are thinking, “I have visited a zoo before. Surly a gathering of this nature could take place the private party room where attendees play pin the tail on the Okapi, eat ice cream cake, and obviate the need for international travel,” there are several other arguments for the event’s implausibility. The first hurdle is the three distinct palates and dietary restrictions. While cakes, pies, and pastries may be appetizing to humans, pandas, giraffes, and rabbits might prefer bamboo, wattle, and carrot salads, respectively. The second hurdle, is their range of size. On opposite sides of the spectrum, the average giraffe is 15 feet tall and 1800 pounds and the average rabbit is 1 foot long and 3 pounds. In many ways – spatially, conversationally, food-portionally – the size difference may affect the party. And finally, animals might find bowties irritating. These obstacles have no place in in Andrea Doss’ paintings. In each canvas, viewers enter Andrea Doss’ world of whimsy, where not only does this event occur, but it looks possible and reasonable. In this world, monsters are timid, mice read bedtime stories, and giraffes, pandas, and rabbits get together for very fancy tea parties. For subject matter, Andrea often chooses animals that represent the opposite extremes of physique. Bears, dragons, monsters, and llamas are paired up with birds, mice, rabbits, cats and hedgehogs. 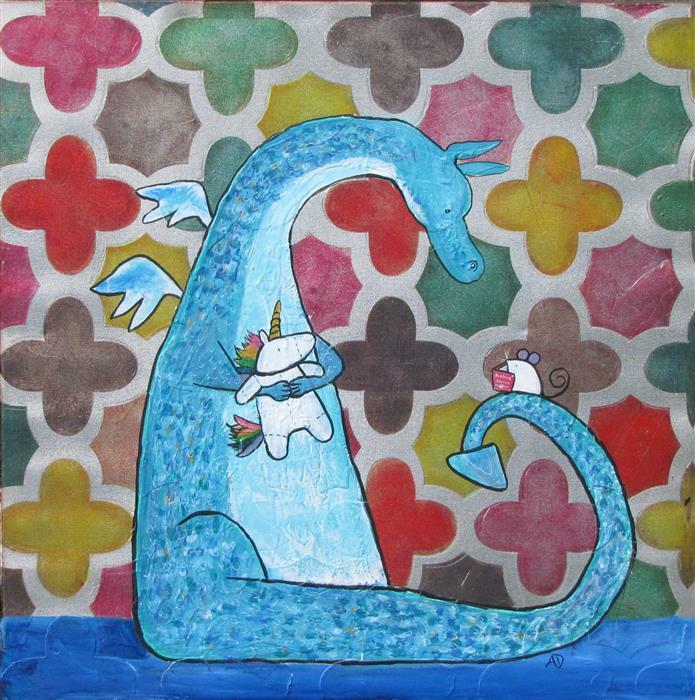 By upending expectations of scale, Andrea cultivates her signature whimsy and charm. This technique is typified in Gerald and The New Friend. In this painting, the two subjects are a miniature black cat and a massive furry monster. The monster is 6 times larger than the cat; and one of the monster’s horns alone outsizes the cat. The spacious difference between scale is crucial to the emotional drama that besets the composition. As Andrea writes, “making new friends always made Gerald nervous.” The difference in scale not only suggests the extent of Gerald’s social anxiety, but fleshes out the furry, snaggletoothed, horned monster with his endearingly shy personality. In addition to friendship, several of the animals form utilitarian relationships with others. This is not as farfetched as one might initially suspect; these relationships resemble symbiotic relationships found in the real natural world. Such as the symbiosis between crocodiles and plover birds, where crocodiles offer the birds food and protection in exchange for pro-bono teeth cleaning. In The Dragon’s Bedtime, Doss paints a dragon offers a mouse a loftier perch in exchange for a bedtime story. The dragon’s protracted tail and the mouse’s literacy become significant points of union between otherwise unrelated creatures. In addition to relationships, “in-between-ness” is a theme throughout Andrea’s portfolio. Her blue-tinged palette gives the sense of twilight. She blurs the line between dark and light, ordinary and extraordinary, young and old, and human and animal. With wondrous lands and magical charm, she nurtures imagination and expresses the full force of her inventiveness. See Andrea Doss's Full Portfolio On UGallery.